Coloring books aren’t just for kids! These activity books serve as a great way to get creative juices flowing and ease your mind of daily stress. 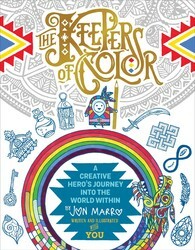 THE KEEPERS OF COLOR by Jon Marro guides you on a creative hero’s journey and helps you rediscover yourself along they way. Be sure to test out this great book and color in Oido the porpoise. When we begin to truly listen, new worlds open within us, and it is not unsurprising that we begin to hear a whole lot more. Oftentimes, that “more” comes in the form of more static, more noise, and more calls to endless adventures. It can be hard to know who’s who and just how and when to listen. Thankfully, the soul is a loyal and loving companion and always finds new messengers to dispatch the summonses requesting our attention. Sometimes these messengers come in the form of life lessons or wise words from a friend, and sometimes they appear in the form of a dolphin dressed in an indigenous sea-vest. Meet Oído, a porpoise with a purpose and Keeper of the Color Blue. Oído was born in the silence of the depths. His mother was the ocean. His father was the very first sound ever made—a deep melodious, primordial sound—the sacred syllable “Om.” Om is believed to be the sound of creation, and thus the first-ever call to adventure. Oído was literally born to fulfill his calling Oído knows that no matter how much chaos and confusion there appear to be, somewhere deep inside, The Seed of Hope is quietly waiting and whispering the perfect instructions out of any mess we may find ourselves in Learning how to listen is learning how to Be. Hear. Now. Did you like Oido? 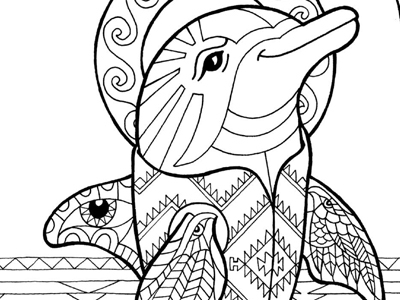 check out our editor’s picks for the best adult coloring books. Excerpted from The Keepers of Color by Jon Marro. Copyright © 2018 by Jon Marro. Used by permission of the publisher. All rights reserved. Like a self-help book found at Hogwarts, The Keepers of Color playfully guides you on a creative hero’s journey through magic, myth, and mindfulness to rediscover the greatest work of your life—you.Begin your own hero’s journey from the mundane to the mystical with The Keepers of Color, a vibrant coloring and journaling workbook that will inspire you to enter a realm of limitless possibility, magical insight, and self-reflection. Unlike traditional coloring books, this is an intentional and sequenced journey from the first to the last page, providing you with the spiritual strength to celebrate your artistic self.